Current users who highly recommend Ariazone equipment worldwide include Rolls Royce, JaguarMercedes-Benznz, Volkswagen China, General Motors, Mazda Australia, Proton Malaysia, Volvo Europe and Air international just to name a few. Our rapid expansion has enabled us to expand our manufacturing facility in Europe and distributors in the U.K, Europe, Asia, Middle East, and recently Russia, with more opportunities pending. Ariazone lubricants are used and distributed exclusively by Behr-Hella globally and is available in Australia through Ashdown/Ingram, Cooldrive, just to name a few. In the lubrication division of Ariazone they are continuing to develop oils such as the fully synthetic POA (polyalphaolefin) lubricant, which contain special additives, is non hydroscopic presents no compatibility problems with seals or residual lubricants and maintains viscosity at temperatures in excess of 600 degrees Fahrenheit. It also carries no hazardous warning labels so is absolutely safe to handle and poses no risk to humans or vehicle duco. 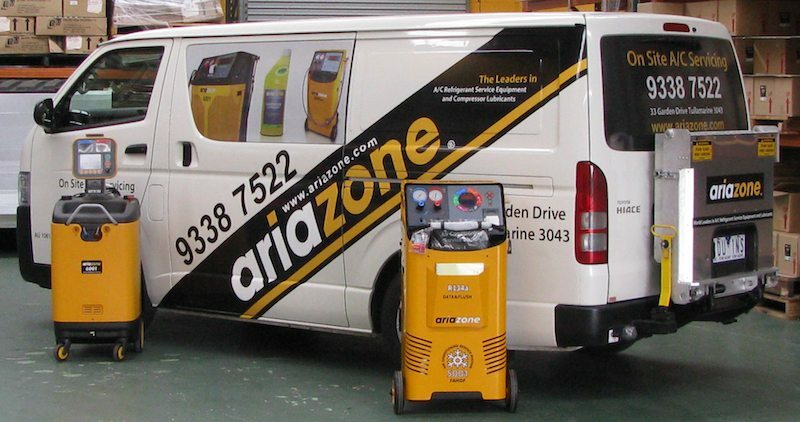 In June 2006, Ariazone international and The Refrigerant Oil Company joined forces to revolutionize automotive air conditioning service equipment and A/C system lubrication. The current line of products in the market known as Ariazone has over 40 years involvement in equipment design and A/C servicing experience and superior synthetic lubricants 25 years in the making. Ariazone service equipment uses state of the art design including features never before seen in the A/C service industry, winning the Australian Design Award in 1994 and 2000 and also receiving the prestigious Power House Museum Award. All the Ariazone products come with full back up support with our service & support team lead by Tony Cannata (technical support consultant) who has over 19 years experience working with and designing Ariazone equipment. Tony’s experience can assist clients with problems associated with equipment and vehicles. He along with Sam LaRosa (sales & marketing consultant) would be happy to assist with any technical or sales inquiry. Put simply the Australian owned Ariazone brand is a market leader and strives to offer the automotive industry technically advanced and reliable, affordable quality products.